As Darren Clarke says, “This is when it starts getting really exciting.” The mantle of Open host has passed from Carnoustie to Royal Portrush and the clock is ticking for the championship to be held outside the British mainland for the first time since 1951, when the Dunluce Links hosted its one and only major. Not that Portrush, and, indeed, seemingly the whole of Irish golf, required next-cab-on-the-rank status for their pulses to soar off the meter. 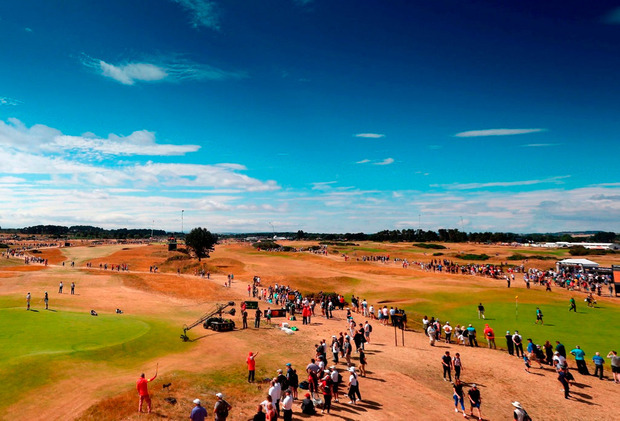 Such has been the level of interest that the R&A has decided that for the first time in the 159-year history of the Open it will be an all-ticket event. The R&A policy was always if people wanted to enter and, more pertinently had the £90 (€100) at hand, then they would not be turned away. But the R&A has come to realise this will just not be feasible for this momentous occasion. 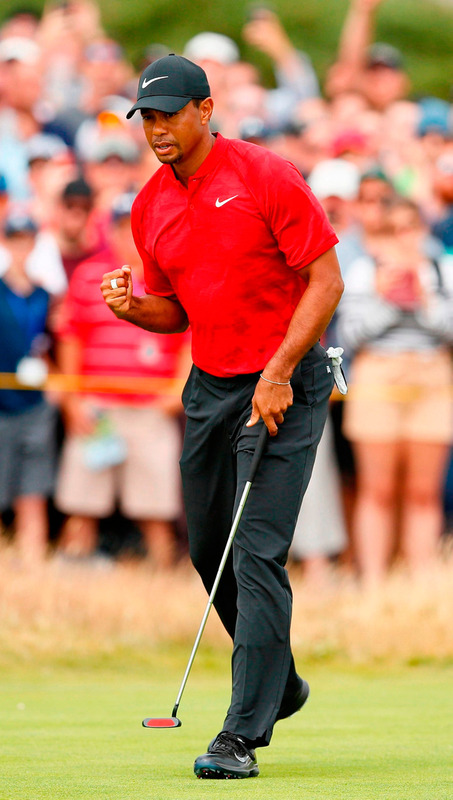 Never mind Carnoustie and Rory McIlroy and the return of Tiger Woods (below) to create the hype; it was there already. On the Monday before the 147th Open in Carnoustie, 20 per cent of the ticket allocation was released – and sold out in less than two days. The organisers called it “unprecedented”, at the same time as upgrading the forecast of the benefit to the Northern Ireland economy to more than £80 million. And with the council spending £17 million on improvements, including a new railway station, to the town which boasts a population of only 7,000, the effects are already being seen everywhere. But then this will be the biggest sporting event the country has ever staged. “That first tranche of ticket sales underlined the level of excitement there is among fans at the prospect of the Open returning to the island of Ireland for the first time in almost 70 years,” Johnny Cole-Hamilton, the R&A’s executive director of championships, said. The R&A is not yet revealing how many tickets in total will go on sale but it is understood it will be no greater than 50,000 a day, with 20,000 grandstand seats. Space appears to be the only thing stopping Portrush from breaking the records set by the 2000 tournament at St Andrews. That witnessed 239,000 swarming through the gates, but Portrush will probably be limited to 200,000. Nevertheless that is not about to dampen the spirits or the anticipation, with Clarke, Portrush’s most famous son and resident, summing up the fervour. “It’s hard to contain the excitement now we are one year out from the Open,” the 2011 champion, said. “The place is buzzing. I’ve been in Portrush a lot recently and all the work is being completed, all the little touches for infrastructure that most would never imagine, with all the cabling under the ground and everything. Clarke was one of the driving forces behind the reinstatement on the R&A rota, yet for so long it seemed to be a forlorn struggle. As recently as 2012, Peter Dawson – the then R&A chief executive – ruled out an “imminent” return, puncturing the bubble created by that year’s Irish Open during which record crowds of more than 130,000 watched Northern Ireland’s trio of major winners – McIlroy, Graeme McDowell and Clarke – compete in Portrush’s first European Tour event in almost half a century. Despite vile conditions the town and the course easily coped. Yet Dawson warned that the Open was on a different scale and declared “a huge amount of money will have to be spent”. The badgering of Clarke, McIlroy and McDowell no doubt helped, but it was the influence and commitment of the Northern Ireland Assembly that was seen as crucial, as was the club’s willingness to build two new holes to accommodate hospitality and everything else associated with staging a major. For Clarke, the announcement in 2015 was “a dream come true”, although nobody even bothered to dream during the Troubles. “I played a lot of my golf here, live here and am a proud member,” Clarke said. “But I’d be foolish to say I ever thought we’d get through the dark times in Northern Ireland to get to this stage where we have the biggest and best tournament in the world. McIlroy added: “The Open 2019 has been something that’s been on my radar for a long time. 60 – Age of Germany’s Bernhard Langer, who rolled back the years in his inimitable style in the final round, adding a level-par 71 to rounds of 73, 71 and 68 to finish on one-under par. “Well, just as I holed my last putt, I was thinking, yeah, this could be my last Open Championship,” said Langer, who could be back if he wins the Senior Open at St Andrews this week. 25 – Willie Park Sr, the first Open champion, took home the Challenge Belt in 1860, then worth £25. That would buy you one Open Championship pin flag and leave you £5 for a couple of coffees in the tented village at Carnoustie. 7,447 – The tee marker to flagstick length of Carnoustie’s Championship links for yesterday’s final round. The R&A played the 7,401 yards course at 7,291 yards on day one; 7,352 yards on Friday and 7,329 yards in the third round, before taking the players right back yesterday. 5.177 – Average score for the par-five sixth, Hogan’s Alley, in yesterday’s final round. The 580-yard hole made famous by Ben Hogan’s pinpoint accuracy from the tee in 1953 yielded just one eagle (Ross Fisher) and only 12 birdies from the 79 players who made the cut. 177,000 – That was the record attendance at Carnoustie last week. The figure was up on the 157,000 that went to Carnoustie in 1999 when Paul Lawrie won in a play-off. Up to 200,000 are expected to head to Royal Portrush next year.